It wouldn't be Christmas in Prineville without a cold, festive evening parade, twinkling light displays, and a world of miniature magic. 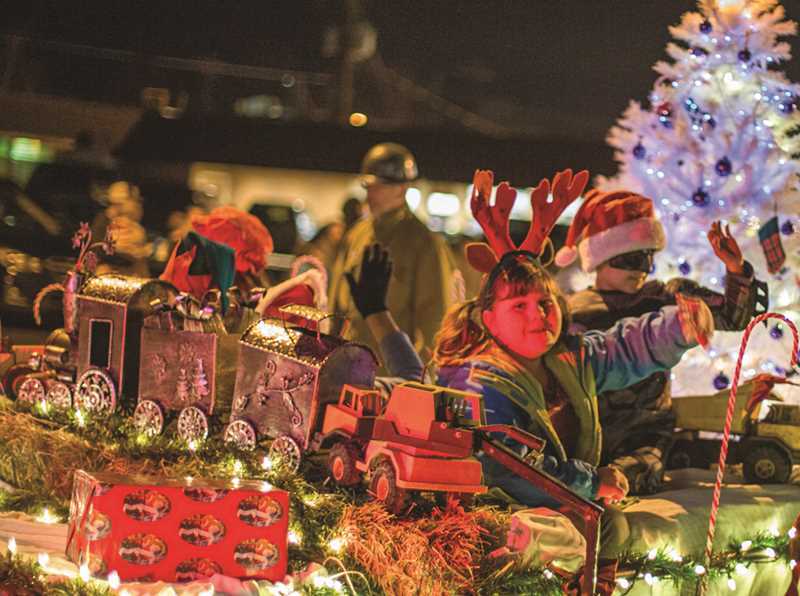 The Annual Lighted Christmas Parade, Christmas in the Pines, and Grimes Family Christmas Scene signal the start of the holiday season in Prineville this weekend. The Grimes Family Christmas Scene opens for the season the Friday after Thanksgiving, Nov. 23, with special hours of 1 to 8 p.m.
"I open at 1 on the day after Thanksgiving simply because so many of our traditional guests are in town for Thanksgiving, and many of them start back before the weekend is over, so this gives them a day to come in and enjoy the Christmas scene," said hostess Beth Grimes. The Grimes family has been collecting miniatures for more than 80 years. Each year at Christmas time, hundreds and hundreds of miniatures are displayed in holiday and secular scenes, including mountain and seaside villages, theatrical stages, forest wonderlands, old-fashioned communities and more. The collection is permanently displayed in a building near the Carey Foster Hall at the Crook County Fairgrounds. Grimes will open the display to the public from 5 to 8 p.m. each Friday and from 1 to 8 p.m. each Saturday and Sunday through Dec. 23. She'll also be open from 1 to 5 p.m. Christmas Eve, which is Monday, Dec. 24. Groups and classes may make an appointment for special viewing times through New Year's. "We've already started making appointments, and it's looking like a busy, busy time. Oh. I'm so excited," Grimes giggled. "Volunteer help has made it come together this year." Grimes, along with assistance from her niece, Linda Hartzell, and some other volunteers, has adjusted quite a few scenes this year, especially in the north end of the building. "I had been given several pieces, and then I found a couple of pieces that were so exciting that I just had to have," Grimes laughed. "So, we made major revisions to the Nativity scene, and we have new moving pieces." Entrance is free, however, donations are accepted. Grimes will be selling raffle tickets for two cookie jars that each come with three dozen cookies from Granny Faye's Bakery. "I'm wanting to get a memorial bench to set in front of the building for the Grimes family," Grimes said. "They are rather expensive. I am diligently trying to raise extra funds for that." Raffle tickets are $1 each or six for $5. Winners will be drawn Christmas Eve. "As we did last year as an appreciation to everyone who comes and visits us, we'll have the drawing for a pan of Granny Faye's famous cinnamon rolls," Grimes said, noting that a winner will be drawn Christmas Eve. The Prineville-Crook County Chamber of Commerce sponsors the Annual Lighted Christmas Parade with the theme "Cowboy Christmas." The parade begins at Northwest Harwood Street at 5:30 p.m. this Saturday, Nov. 24 and will travel down Northeast Third Street, ending at Northeast Fairview Street. Participants this year are stringing up their lights and decorating their float to be judged for the best depiction of Cowboy Christmas. "It's a Western theme. That theme was voted on by all of the Chamber members," pointed out Chamber Executive Director Kim Daniels. Last year, the parade had 20 floats, and Daniels said they are still accepting applications for entries. The Prineville Police Department will lead off the parade. The Chamber float will come next, followed by a variety of floats, including commercial, walking groups, animal entries, civic, fraternal, non-profit and church groups. The National Guard will bring up the rear, featuring Santa Claus himself. Those with a parade float must check in at 4 p.m. at Northwest Deer Street between Northwest Third and Northwest Fourth streets. Lineup is on a first-come-first-serve basis and will begin at 4 p.m. on Northwest Deer and Northwest Fourth and Northwest Fifth streets. Judging will take place before the parade during lineup. Judges will look for decorations reflecting the theme of "Cowboy Christmas." Daniels said the parade generates business and energy in downtown Prineville. "There will be several businesses and restaurants still open," she said. "It kicks off the holiday season and gets people downtown." After watching the parade, spectators are welcome to head down to the Crook County Fairgrounds for the opening night of Christmas in the Pines. The drive-thru light display opens at 5:30 p.m. and continues through 9 p.m. each Friday, Saturday and Sunday evening through Dec. 23. The Christmas lights will be on Christmas Eve and Christmas night as well. "I plan is to leave them on all night Christmas Eve," said Christmas in the Pines President Gail Merritt. Christmas in the Pines features a live Nativity scene every Saturday as part of the drive-thru display. Also every Saturday evening, Santa and Mrs. Claus will be in the Santa Room adjacent to Grimes Christmas Scene, and families are welcome to visit, take photos and enjoy some cookies. Organizers suggest nonperishable food and/or pet food donations for admission, and they also appreciate cash donations. Food will be donated to the Holiday Partnership and Lutheran Community Services, and pet food will be donated to Humane Society of the Ochocos. Merritt said volunteers have been hitting it hard to prepare for the light show since October. "We have a lot of volunteers that have put many hours in," she said. "We have quite a few new exhibits this year. We have exhibits going down our exit road that different businesses have contributed to Christmas in the Pines." There are also some new gingerbread scenes, and there's the traditional ice-skating rink. "We have a winter wonderland scene. We've enlarged our farm scene that we have here," Merritt added. She encourages families to come out to see the lighted wonderland. "Christmas in the Pines has been put on by many volunteers who love our community and want to give them something special at Christmas time," she said. "They should bring their children down here and see the bright lights."